Do you know a student with exemplary writing skills who is personable and able to help other students? The Writing Center is looking for him or her! We need juniors, seniors, and graduate students with stellar grades in English and writing-intensive classes to join our team. Students should be willing to submit a sample research essay, transcripts, and reference letters in addition to the application found through the student employment website. Look for the posting titled ‘Writing/Research Consultant‘. Questions should be directed to Nicole Bailey at Nicole.Bailey@indstate.edu. Thanks for supporting your ISU Writing Center! and I am the new Writing Center Coordinator at Indiana State University’s Cunningham Library. I come to the Terre Haute community from the far off wilds of central Pennsylvania. I have also lived, studied, and worked in England, South Korea, and the only slightly less exotic Baltimore, Maryland. Though I come from a varied work background, this will not be my first time leading a Writing Center team; in the past I was Associate Director for the Shippensburg University center, as well as a professional tutor at Harrisburg Area Community College. I enjoy the challenges and creativity that come along with Writing Center work, though more than anything I enjoy engaging with the inevitably wonderful students who work in and visit WCs. I also teach English Composition online, in person, and via podcast. Just this summer I taught my 40th Comp. class! So far I am having a great time here in the library, so stop by and see me if you’re on campus; I can usually be found near the coffee. The annual recognition of Women’s Equality Day will take place on August 29, 2011, in the Library Events Area from 4-5:30pm. This year our event is sponsored by Interdisciplinary Programs, College of Arts and Sciences and College of Education. As you know, we recognize Women’s Equality Day across the country on August 26th to commemorate the passage of the 19th Amendment to the Constitution granting American women the right to vote. We have annually seized the opportunity to recognize and celebrate the work of women at ISU as well as reflect on the challenges still to be overcome. This year’s event will include a proclamation by President Bradley, recognition of women in leadership, those who have received promotion, tenure, and University awards, as well as those who have retired. 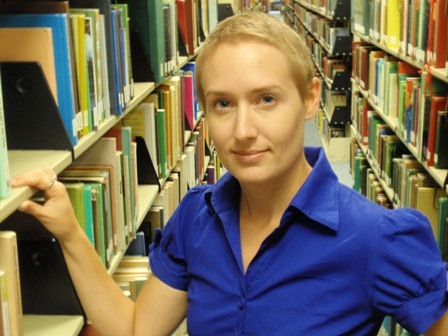 Further, awardees of the 2011 Zietlow Research Award for Women Faculty will be announced by Charlotte Zietlow and the Women’s Studies Program will also recognize students with the 2011 Mary Elizabeth Owens Dailey Award, presented by Sherron Dailey. Light refreshments will be served and poster presentations from Women’s Studies 200 classes will be on display. You are also invited to remain with us in the Library Events Area from 6:00-8:00pm for a screening of Iron Jawed Angels, (2004), starring Hilary Swank, Frances O’Connor, Julia Ormond, and Anjelica Huston. The film focuses on the American women’s suffrage movement in the early 1900s and the passage of the 19th Amendment. The film is being sponsored by the Office of General Education. As a part of the Wabash Valley Civil War Sesquicentennial Digitization Project, Wabash Valley Visions and Voices is reaching out to the community for Civil War items. The project, along with the Sullivan County Public Library, will hold a Community Scan Day on Aug. 20 from 10 a.m. to 2 p.m. at the library located at 100 S. Crowder Street in Sullivan. Area residents are encouraged to bring Civil War items such as letters, diaries, photographs, documents, and artifacts to be photographed or scanned. The digitized items will be added to the Civil War database that is being constructed. The Digitization Project is made possible by a nearly $19,000 grant from the U.S. Institute of Museum and Library services, administered by the Indiana State Library. ProQuest® will be performing infrastructure maintenance on August 20, 2011. A twelve (12) hour maintenance window will be required for this maintenance. The window will take place from Saturday, August 20, 2011, at 22:00 ET to Sunday, August 21, 2011 at 10:00 ET. Eighth District U.S. Rep. Larry Bucshon will host a roundtable discussion on Medicare from 6:30 – 8 p.m. Wednesday, Aug. 17 in the Cunningham Memorial Library Events Area. The event is open to the public. As of Thursday August 11, we have implemented the new ProQuest platform. Links on the database Web pages have all been replaced with links for the new platform and are visible to users. One excellent new feature: if you are a regular user of the Ebscohost’s MyFolder feature [create login, materials placed in folder stay in folder], ProQuest now offers My Research with similar features – perfect for the long-term researcher! Learn how users will be able to search, find, use, and share their research in exciting ways. We will also answer questions and show you how to access support, including tutorials, help pages and documentation. RECOMMENDED: Familiarity with the new ProQuest platform basic search features or prior viewing of the Introduction to the New ProQuest Platform session. See how the powerful My Research tool—now on the new ProQuest platform—allows users to create a profile within their institutional account to save and organize search strategies and references, create and save RSS feeds, email alerts, tags, and shared lists.